The basic building block of Amazon RDS is the DB instance. The DB instance is where you create your MySQL databases. For an example that walks you through the process of creating and connecting to a sample DB instance, see Creating a MySQL DB Instance and Connecting to a Database on a MySQL DB Instance. In the top right corner of the AWS Management Console, choose the AWS Region in which you want to create the DB instance. In the navigation pane, choose Databases. If the navigation pane is closed, choose the menu icon at the top left to open it. Choose Create database to open the Select engine page. In the Select engine window, choose MySQL, and then choose Next. We recommend these features for any production environment. Choose Next to continue. The Specify DB details page appears. On the Specify DB details page, specify your DB instance information. For information about each setting, see Settings for MySQL DB Instances. Choose Next to continue. The Configure advanced settings page appears. On the Configure advanced settings page, provide additional information that Amazon RDS needs to launch the DB instance. For information about each setting, see Settings for MySQL DB Instances. On the final page, choose View DB instance details. On the RDS console, the details for the new DB instance appear. The DB instance has a status of creating until the DB instance is created and ready for use. When the state changes to available, you can connect to the DB instance. Depending on the DB instance class and storage allocated, it could take several minutes for the new instance to be available. To create a MySQL DB instance by using the AWS CLI, call the create-db-instance command with the parameters below. For information about each setting, see Settings for MySQL DB Instances. The following example creates a MySQL DB instance named mydbinstance. To create a MySQL DB instance by using the Amazon RDS API, call the CreateDBInstance action with the parameters below. For information about each setting, see Settings for MySQL DB Instances. The following table contains details about settings that you choose when you create a MySQL DB instance. The amount of storage to allocate for your DB instance (in gigabytes). In some cases, allocating a higher amount of storage for your DB instance than the size of your database can improve I/O performance. For more information, see DB Instance Storage. Choose Enable auto minor version upgrade to enable your DB instance to receive preferred minor DB engine version upgrades automatically when they become available. Amazon RDS performs automatic minor version upgrades in the maintenance window. The availability zone for your DB instance. Use the default value of No Preference unless you want to specify an Availability Zone. For more information, see Regions and Availability Zones. The number of days that you want automatic backups of your DB instance to be retained. For any non-trivial DB instance, you should set this value to 1 or greater. For more information, see Working With Backups. The time period during which Amazon RDS automatically takes a backup of your DB instance. Unless you have a specific time that you want to have your database backup, use the default of No Preference. Select this option to copy any DB instance tags to a DB snapshot when you create a snapshot. For more information, see Tagging Amazon RDS Resources. The name for the database on your DB instance. The name must contain 1 to 64 alpha-numeric characters. If you do not provide a name, Amazon RDS does not create a database on the DB instance you are creating. To create additional databases on your DB instance, connect to your DB instance and use the SQL command CREATE DATABASE. 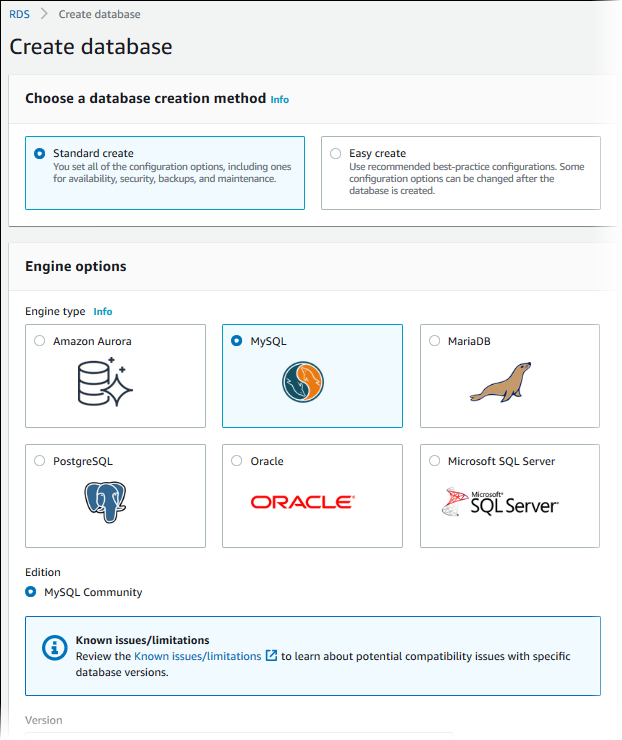 For more information, see Connecting to a DB Instance Running the MySQL Database Engine. The port that you want to access the DB instance through. MySQL installations default to port 3306. If you use a DB security group with your DB instance, this must be the same port value you provided when creating the DB security group. The firewalls at some companies block connections to the default MySQL port. If your company firewall blocks the default port, choose another port for your DB instance. The version of MySQL that you want to use. The configuration for your DB instance. For example, a db.m1.small instance class equates to 1.7 GiB memory, 1 ECU (1 virtual core with 1 ECU), 64-bit platform, and moderate I/O capacity. If possible, choose an instance class large enough that a typical query working set can be held in memory. When working sets are held in memory the system can avoid writing to disk, and this improves performance. For more information, see Choosing the DB Instance Class. The name for your DB instance. Your DB instance identifier can contain up to 63 alphanumeric characters, and must be unique for your account in the AWS Region you chose. You can add some intelligence to the name, such as including the AWS Region you chose, for example mysql-instance1. A parameter group for your DB instance. You can choose the default parameter group or you can create a custom parameter group. For more information, see Working with DB Parameter Groups. Deletion protection Enable deletion protection to prevent your DB instance from being deleted. If you create a production DB instance with the AWS Management Console, deletion protection is enabled by default. For more information, see Deleting a DB Instance. Enable Encryption to enable encryption at rest for this DB instance. For more information, see Encrypting Amazon RDS Resources. Enable enhanced monitoring to gather metrics in real time for the operating system that your DB instance runs on. For more information, see Enhanced Monitoring. Enable IAM DB authentication to enable IAM database authentication for this DB instance. For more information, see IAM Database Authentication for MySQL and PostgreSQL. MySQL has only one license model, general-public-license the general license agreement for MySQL. Select the types of MySQL database log files to generate. For more information, see MySQL Database Log Files. The 30 minute window in which pending modifications to your DB instance are applied. If the time period doesn't matter, choose No Preference. For more information, see The Amazon RDS Maintenance Window. The password for your master user account. The password must contain from 8 to 16 printable ASCII characters (excluding /,", a space, and @). The name that you use as the master user name to log on to your DB instance. For more information, and a list of the default privileges for the master user, see MySQL Security on Amazon RDS. Create replica in different zone to create a passive secondary replica of your DB instance in another Availability Zone for failover support. We recommend Multi-AZ for production workloads to maintain high availability. For development and testing, you can choose No. For more information, see High Availability (Multi-AZ) for Amazon RDS. An option group for your DB instance. You can choose the default option group or you can create a custom option group. For more information, see Working with Option Groups. Yes to give your DB instance a public IP address. This means that it is accessible outside the VPC (the DB instance also needs to be in a public subnet in the VPC). Choose No if you want the DB instance to only be accessible from inside the VPC. For more information, see Hiding a DB Instance in a VPC from the Internet. The storage type for your DB instance. For more information, see Amazon RDS Storage Types. This setting depends on the platform you are on. If you are a new customer to AWS, choose default, which is the default DB subnet group that was created for your account. If you are creating a DB instance on the previous E2-Classic platform and you want your DB instance in a specific VPC, choose the DB subnet group you created for that VPC. This setting depends on the platform you are on. If you are a new customer to AWS, choose the default VPC shown. If you are creating a DB instance on the previous E2-Classic platform that does not use a VPC, choose Not in VPC. For more information, see Amazon Virtual Private Cloud (VPCs) and Amazon RDS. If you are a new customer to AWS, choose Create new VPC security group. Otherwise, choose Select existing VPC security groups, and select security groups you previously created. When you choose Create new VPC security group in the RDS console, a new security group is created with an inbound rule that allows access to the DB instance from the IP address detected in your browser. For more information, see Working with DB Security Groups (EC2-Classic Platform).